What’s missing on your shelves? Looking for ways to provide your customers with unique products that capture their attention, build customer loyalty and increase their shopping basket base? We’ve helped national and international retailers realize how profitable coffee products can be on their store shelves. By offering unique and seasonal package designs, you’ll keep your customers in your store longer, providing them with convenience, selection and value, which will consistently lead to repeat business for you. We pride ourselves on bringing innovative and appealing package designs for everyday and seasonal coffees, along with the most popular trends such as organically grown, Fair Trade sourced, seasonal flavors and single-serving pods that are sure to attract the attention of your shoppers. We’ll meet your retail needs. Call us today! MEET STEVE MORRIS President & C.O.O. 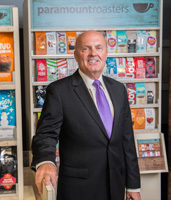 Steve Morris has been with Paramount Coffee Company since 1993, and he continually identifies innovative strategies for growth, such as the tremendously successful entry Paramount made into the specialty retail markets with creative packages and branding concepts.